I will admit, when it comes to obsessions, I have alot of them. One of my biggest and favorite indulgence is jewelry. I think it started when I was little and would go to my grandparents house. My grandmother had a massive collection of costume jewelry that gave me many hours of happiness. From simple and classic to bold and dramatic... I love it all. At some point, it gets harder and harder to find unique pieces to add to my jewelry box. So much of it is poorly made or just blah. I want to wear something that makes people gush over it. I want standout 'look at me fabulousness'. Is that so much to ask? .. not anymore! 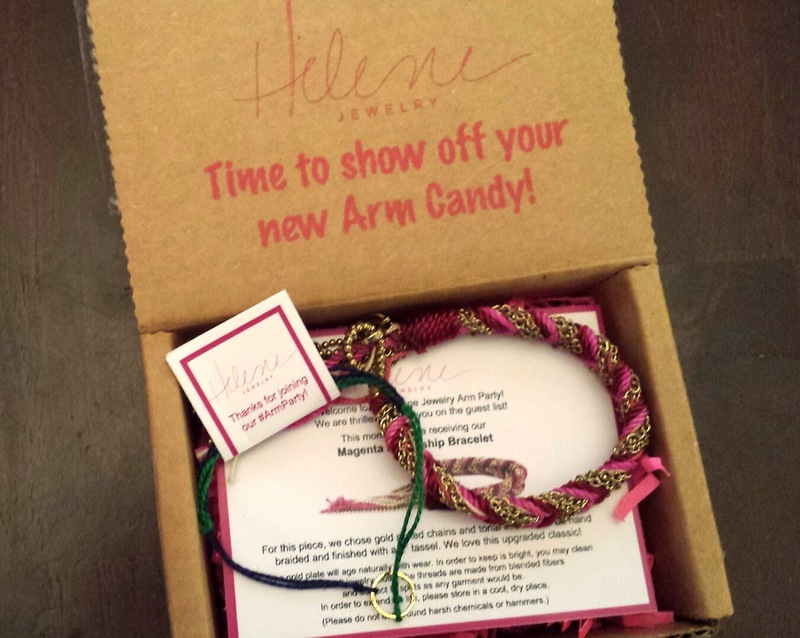 Helene Jewelry Arm Candy, who kindly sent me this box for review, is a monthly subscription service that delivers new, high quality and unique bracelets to your door. The cost is $25 per month and you take a bit of a survey upon signup so they can gage your style and color preferences and find items to fit your taste. I have been over the moon excited to receive this box and I have no shame in saying I squealed a bit when it was delivered! Inside, the first thing I saw was an information card about the piece and also about a little bonus that they included. It's such a nice presentation too! This is the bonus item. I know you all remember wish bracelets! 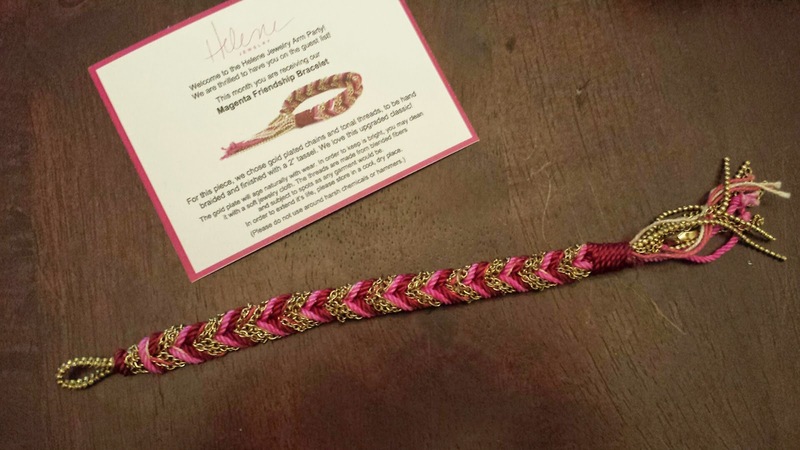 Once they fall off your wrist the wish you made is said to come true! It's very cute and dainty piece and I love the gold circle. Gives it a more grown up feel! 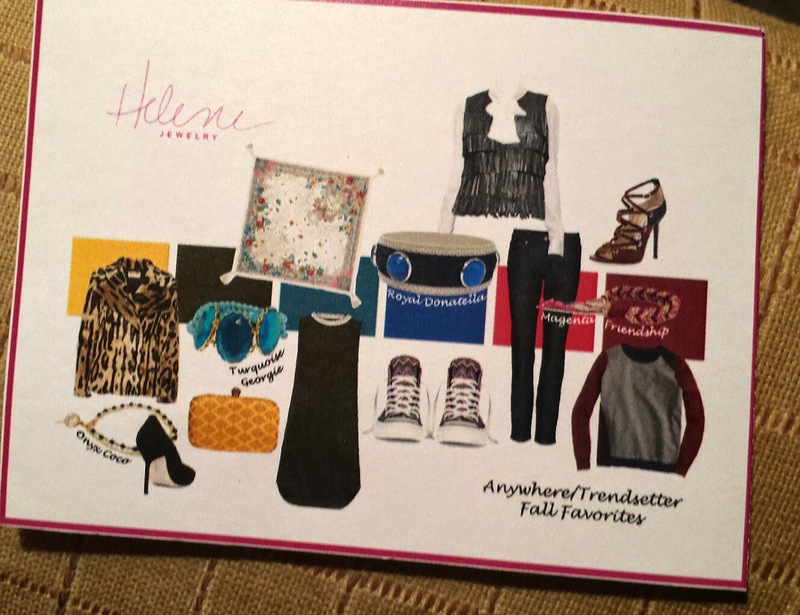 Also included as a special bonus is little trend board created to compliment your style preferences. It's a fun little addition to the box. Now onto the main attraction! I can't even begin to explain how absolutely gorgeous this is and the pictures don't do it justice. 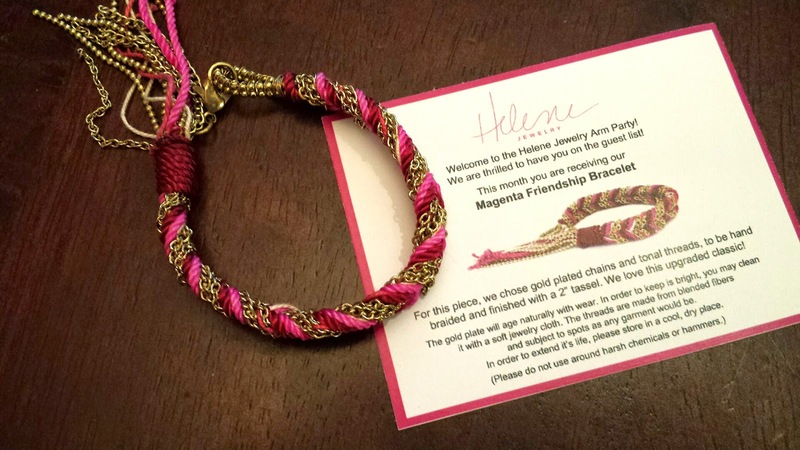 Not only is the magenta color perfect, I also love how it's a classy twist on the standard friendship bracelet. 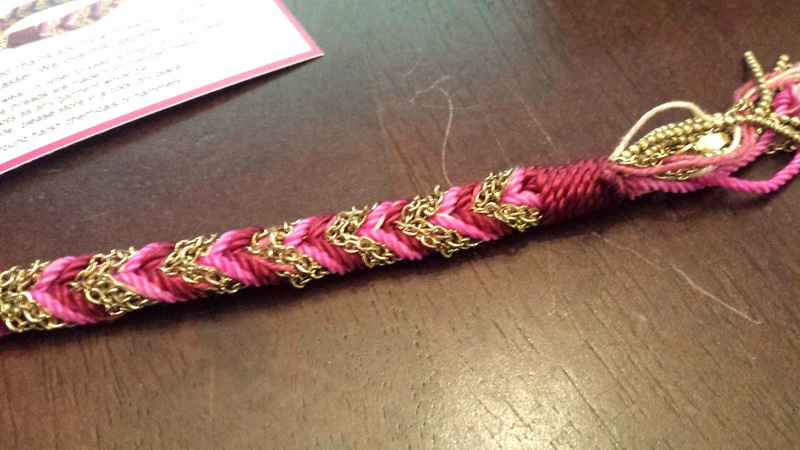 This herringbone braided bracelet features two gold plated chains handwoven with tonal threads. The craftsmanship is just unbelievable. It screams high quality and you can tell how much creative care went into its construction. The tassels on the end are my favorite detail. I can see this easily becoming an everyday favorite for me! It's just so pretty!! 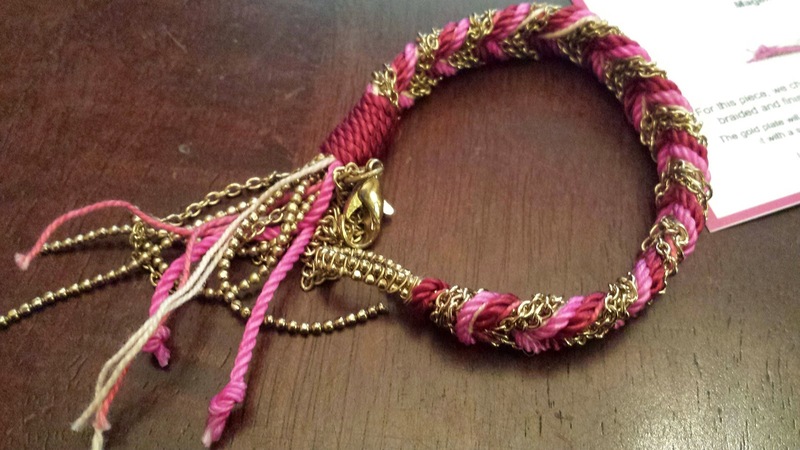 It's not often that a find a bracelet that wows me as much as this one. For $25 a month, it is completely worth every penny spent. 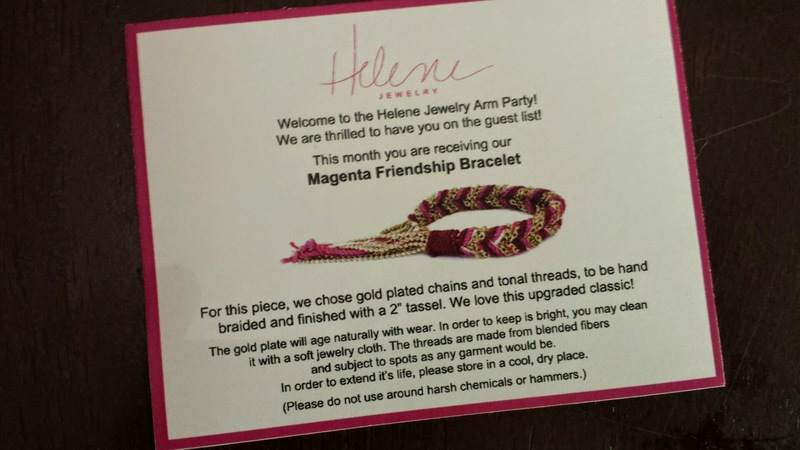 Helene Jewelry knows how to deliver trendy and quality items that can stand the test of time to give you something to really and truly treasure. Now what are you waiting for? 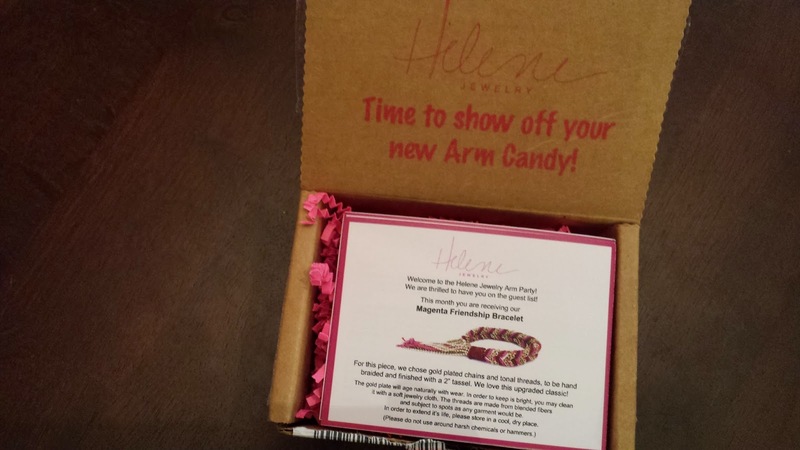 Click here to check it out for yourself and join the Arm Party!